I had the pleasure of listening to a french speaker while in Paris talk about transitioning into French culture and she touched on a topic that I became fascinated with. She talked about the analysis of why the french eat yogurt, dijon dressing and always have a salad to complement a meal. I was intrigued. She started with the sentence “Go, just go order a quiche lorraine at any cafe, bistro or restaurant here in Paris and you will always receive a salad with dijon vinegary dressing to accompany your quiche.” Why? Well to aid in proper digestion of course. The french view food as pleasure number one, but for centuries they have combined a fermented food with their meals to enhance digestion and aid in nutrition and proper breakdown of vitamins and minerals. Usually, when the bread was brought to my table in Paris so was a small jar of dijon mustard. When I ordered a cheese plate, it came with olives and a small amount of field greens with strong vinegar. You can also bet she was right about the quiche. I ordered a quiche three different times and her theory never failed. The quiche contains fat, carbs and protein and needs acidity to properly breakdown in your body. Always, the salad was present. I am also passionate about nutrition and how the body uses food as healing so to combine my favorite culture with food nutrition was a topic that had my complete and utter attention. I listened to her speak for two hours. In that time she discussed many subjects regarding french culture but this one motion stood out and I sought my own research. I pondered other cultures and became aware that possibly this is why pickled herring, sauerkraut and kimchi exist as well?! She went on to say that the french also only eat foods in season. Their country naturally works this way on supplying produce, whereas in America we can get mangos and strawberries at Christmas and apples in June. It really is so important to understand where our produce is coming from to benefit our overall health. Always read labels and try whenever possible to support local farmers. I could go on and on but I will save that for a future post. I absolutely was enthralled with this woman and what she had to say. Now on to the recipes and inspiration! I ordered the Chèvre Chaud in Paris almost daily. 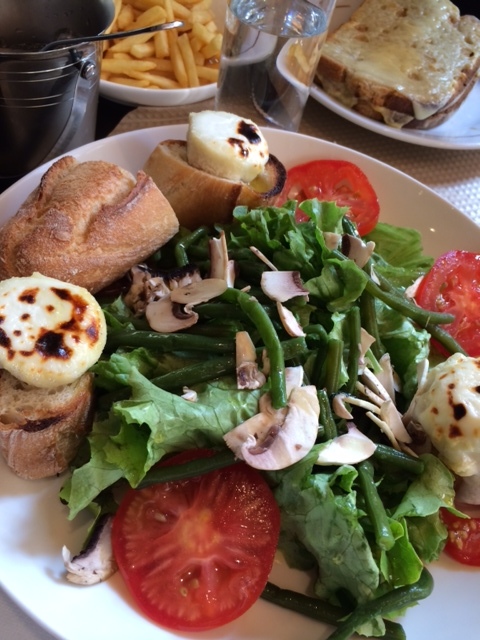 This was composed of simple greens and vegetables served with baguette and warm goat cheese. It was absolutely divine! 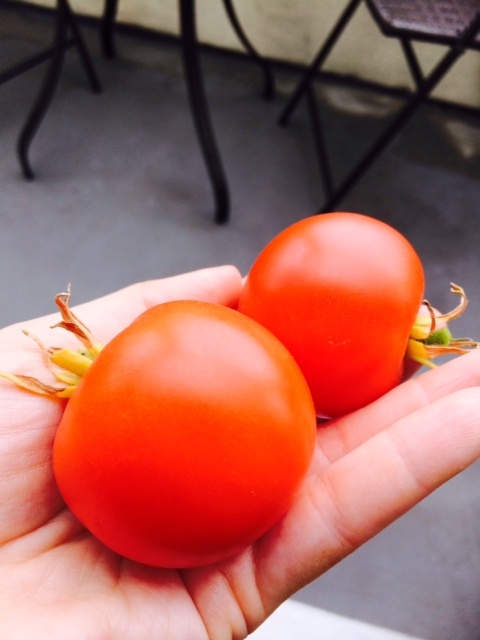 Noticing yesterday that my tomatoes needed to be used and I had fresh buffalo mozzarella in my fridge I did a spin on what I had in Paris…warm cheese, baguette, tomatoes and greens! A typical french vinaigrette is using one part vinegar to three parts olive oil. Then add in dijon mustard and salt and pepper and whisk until homogenized. Herbs can also be added. For my tomatoes and mozzarella I used balsamic vinegar in the dressing, however any vinegar will work. Preheat the broiler or turn oven to 500 degrees F. Slice cheese into disks. Drizzle baguette slices with olive oil. Place cheese disks on baguette slices. Put baguette slices topped with cheese on a sheet pan lined with foil under the broiler for 2-3 minutes…watch carefully as to not burn. Remove from oven. Toss greens with vinaigrette (above recipe). 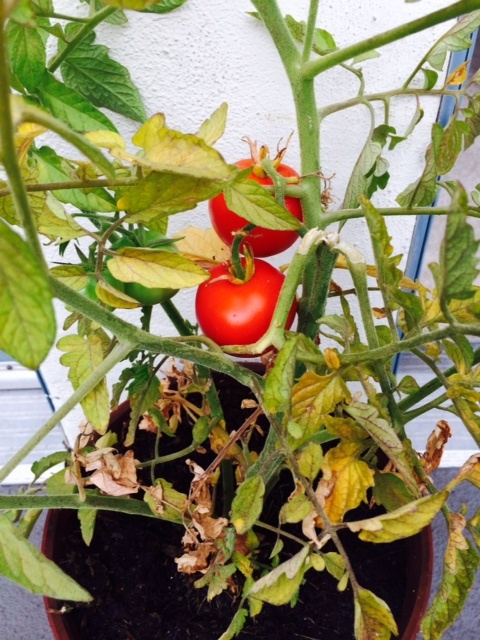 Place quartered tomatoes around the greens. Arrange baguette slices topped with melted cheese angled on greens and drizzle with balsamic vinegar. 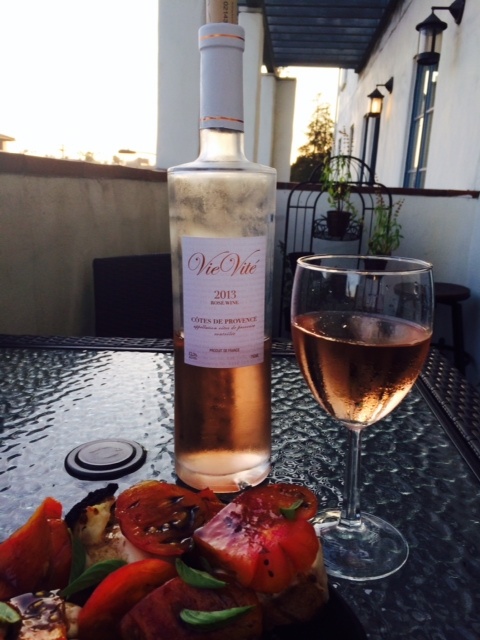 This salad is delicious especially in the summer when tomatoes are at their peak served with a nice chilled wine. Enjoy! Hi Krista, you make learning about food so much fun and exciting. I have tried all of your recipes and I love them all. Your passion is contagious. Thanks for taking the time to write and share…I am a big fan! I read this earlier this week and I bought goat cheese today to make this over this week. Yum!